I’ve recently been doing my own blow dry and curling which I haven’t done since high school, and I’ve found it to be cost-effective and less of a hassle then visiting the salon once or twice a week. Practice makes perfect and it doesn’t hurt to learn some killer tips from an expert, so here is a step-by-step tutorial from Gabie Vossler. As a hairstylist, I have to say the number one thing my clients in the salon want to learn is how to do a good blowout at home on their own hair. A good blow out can last anywhere from 2-4 days depending on the person’s hair and technique. Here are a few tips on getting that perfect, smooth, and least damaging blowout! In order to prolong your hair tools (round brush, paddle brush, etc.) Do not touch the nozzle of the hair drier to the bristles of the brush. Not only does this damage the brush bristles, but it can also singe the hair. Keep the nozzle just above the hair and brush when smoothing and drying. Although it does speed the drying time to flip your hair over and wave the hair drier back and forth over the hair, it is not doing your style any justice. To get a smooth blow out like you receive in the salon, always point the nozzle on the dryer downwards when going over the hair shaft. This smooths the cuticles of the hair down and will reduce the amount of frizz. Use a concentrator on the nozzle of the dryer to focus the airflow where you want it. The grill of the hairdryer is extremely hot and will damage the hair if it is being pressed against it. Also, a concentrator helps make it easier to smooth hair down and eliminate frizz. It is important to keep the hair drier moving to prevent heat damage. 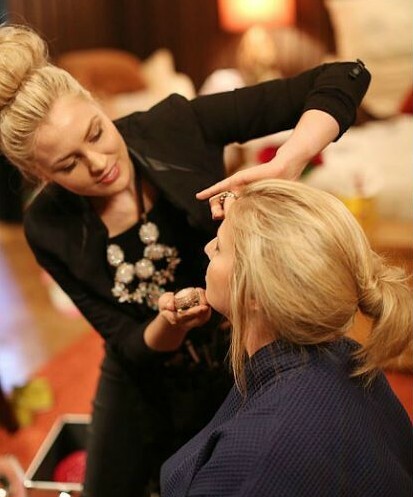 If you choose to use a round brush, keep twirling the brush slowly as you move down the hair strands. Slow movement is easier on the arms rather than pulling the brush through the hair quickly over and over. After you have mastered smoothing the hair, when it is about 80% dry, you can twist the round brush around 2-3 times to create a loose curl or wave. Product (mouse, hairspray, volumizing spray) can help hold the style if you have straight hair naturally (zero texture). The top two pictures to the right have been styled using the twisting technique. Be patient of the blow out does not come out perfectly the first time. Blowing out hair takes patience and practice, but the outcome is worth it! I recommend Olivia Garden round brushes as they evenly distribute heat through the hair, move smoothly, and do not rip out strands. Good luck! Thanks for the helpful tips! I will try sectioning out my hair this week when I blow dry it and also use a round brush. I’m a fan of the cost-saving post, thanks! !